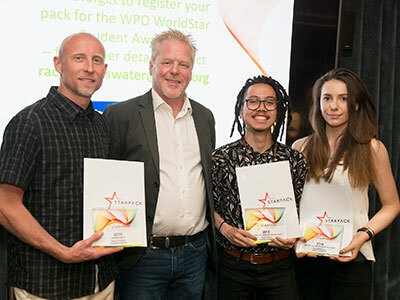 The Student Starpack Industry Awards scheme was established in 1964 and this year is the fourth year in a row where students from Teesside University have taken home prizes. Starpack recognises a growing demand for packaging designers – people who can design packs that are not only attractive but also functional, and that can be produced cost-effectively while considering environmental issues. The students entered briefs in three categories: The Future Milk Bottle, Motor Oil Dispensing Pack and Luxury Gift Packaging – family range of cans for teas or coffees. Ralph Deloso, David Donaghue and Beth Sanderson came away with gold awards for their designs. Meanwhile Chris Armstrong and Declan Carter took home silver and Abul Habeeb and Chantelle Wilson were highly commended. Ralph, who submitted designs in The Future Milk Bottle category, was recognised for his contemporary design and adding a ‘sporty feel’ to an everyday product. The judges commented on his well-executed visuals, boards and mould and great branding. As part of his Gold award, Ralph won an all-expenses paid trip to Portugal to visit Logoplaste, an industrial group, manufacturing rigid plastic packaging for some of the most reputable companies in the world, in the food and beverage, personal care, household care and oil and lubricants sectors. Beth Sanderson also won Gold and the Sponsor Winner award for her motor oil pack design, with judges commenting on Beth’s exemplary approach and presentation and the practicality of her design. 'My project focused on creating a more user-friendly and ergonomic design that allows the user to dispense oil with no extra utensils and no risk of mess. The oil flow can be controlled using the spout or lid while it also draws in air to prevent glugging,' Beth explained. These latest awards build on past successes from product design students, with the University picking up four awards in 2017, 11 awards in 2016 and two in 2015. Principal Lecturer Mark Freary said: 'We are delighted that so many of our students have received awards again this year. They have all worked exceptionally hard and it is fantastic to see their creativity recognised in this way.